Welcome back to Behind Closed Ovens, where we take a look at the best and strangest stories from inside the food industry. This week, we’re back to the classics: wonderfully, beautifully stupid restaurant customers. As always, these are real e-mails from real readers. I was working for an upper-ish scale fusion restaurant in Brookline, an affluent neighborhood just outside of Boston. Even though Brookline ranked on Forbes list of America’s Most Educated towns, I can honestly say that it contained far and away the most ridiculous customers I’ve ever worked with. I was working as a host five to six days a week and I had gotten pretty good at handling customer silliness. One man called in to make a reservation for dinner and when I asked what day and time he had in mind, he audibly sighed and asked why I couldn’t just have a table ready for him whenever he showed up. Another couple refused the manager’s offer to comp their entire meal (the waiter had given them a spoon with garlic crusted on it for their desert by mistake) and I didn’t understand why until I saw their floridly nasty Yelp review they probably took near-sexual pleasure in writing. Another man called in to make a reservation for his wife’s birthday and asked for a table “where we can’t see that we’re sitting near rows and rows of other tables” on a packed Friday night. But that’s small potatoes to one night in particular. It was a Saturday and it was predictably nuts. We were right in the middle of a rush and we had a bunch of large parties coming in all around the same time. One was a party of ten. Their table was ready and the menus were laid out in anticipation. A blonde woman, maybe 21 years old came in with a clutch of friends. They approached the host stand and she gave her name for the reservation. I got a cold prickling feeling on the back of my throat. We were packed to the rafters and nearly every other table was taken or about to be taken. I noticed that the reservation was confirmed earlier that day as ten people and asked her if she had confirmed that number. I didn’t understand and asked her what she meant. She went on to explain that she figured if she told the restaurant it was a party of 20, we wouldn’t be able to take the reservation, so she lied about the number to make sure we did. This was clearly some sound logic. I explained to her that we had organized the night on the assumption that her party would be the size she confirmed it at and that we wouldn’t be able to accommodate a party of that size now with the dining room almost entirely full. “But I told you that number to make sure we could get in!” She said this in a tone that suggested she somehow thought this was a favor to me. “I don’t understand why we can’t just double it!” When I suggested that we could seat them later in the night once we had more space, she started crying. Like, big full-on sobs. Her friends comforted her, but they seemed pretty embarrassed and surprised by the whole thing. My manager came over to check our numbers on the screen because he spent busy nights like this out on the floor helping with seating and serving and noticed the whole scene being made. He asked what was going on and I politely explained situation to him. The woman started crying harder, asking over and over why we couldn’t just take them now and I think the booze had just totally caught up with her. The manager did his best to console her, but eventually, her friends told us they’d take care of it and ushered out. The manager turned to me with big wide eyes and asked, “What the hell? !” As far as I know, the rest of her party never showed up, so I imagine there was a lot of frenzied texting about the situation. I haven’t worked food service, but I have worked retail. I can say I’ve had stupid customers. I can’t say I’ve had any that were as stupid as my friend’s once-girlfriend. It’s been ten years, and I still tip heavily whenever I return to Claim Jumpers in California. If the waitress had stared any harder at her, Girlfriend’s head might’ve exploded. Our server said she would check. She never came back. Another waitress came and server us, saying ours had gone into over time and needed to end her shift. We ordered our food, and as we were paying our bill, our first server appeared at another table. The amount of stupid that came from my friend’s girlfriend had scared her off. I am a hostess at a popular diner in Virginia. Part of my job is to take to-go orders. I used to work for a chain pub company called Wetherspoon, and every Tuesday was Steak Night. Unfortunately, the prospect of a £5 steak with a free pint of beer brings out a lot of people who just don’t know anything about good, grilled meats. Often, we’ll get the typical complaints of “this well done steak is overcooked,” or “I ordered medium rare, but there’s blood in it,” but one customer almost shut the kitchen down out of sheer disbelief. The member of staff comes back as soon as they’ve been to the table. I worked at a brewpub that served typical brewpub food. Burgers, sandwiches, salads, a couple steaks, you get the idea. Nothing fancy. One of the items on the menu, which was a favorite among the regulars, was a skirt steak sandwich that came with a caesar salad. And here is where our story begins. Still puzzled, she asks if the salad comes inside the sandwich. I inform her that no, the salad is on the side and she can substitute fries or a regular salad if she’d like. She looks me straight in the face and says, “but it’s a sandwich?” I confirm once again that it is in fact a sandwich, she shakes her head and says, “well, I guess I’ll have that.” At this point her companion is just staring at her with a look of complete confusion. She ate the whole thing. Pretty sure she licked the plate clean. When I first moved to Fort Lauderdale, FL, I waitressed at a sports bar that specialized in seafood. We had many dishes made with “dolphin”—not actual dolphin, but for some reason Mahi Mahi was commonly referred to as “dolphin” in this area. (Editor’s Note: No, it doesn’t make much sense. Yes, it seems unnecessarily confusing. Shut up and read your story) We had a lot of tourists come in who understandably weren’t familiar with this fish or its nickname, so I was accustomed to frequently explaining this. One day a couple came in, ordered sodas, and started to peruse the menu. The wife became very alarmed when she saw dolphin on our menu and proceeded to loudly berate me for serving dolphin. I explained several times that the dolphin on our menu was a different creature than the one she was thinking of, even pointing to a large plastic Mahi we had hanging over the bar. The customer simply didn’t understand and was getting more and more agitated. She then said, “And where are the pancakes?” After a few befuddled seconds I realized she thought they had walked into the IHOP, which was next door. When I pointed out the window to the IHOP, easily visible from their seats, they got up and walked out, still huffing about the brutality of serving dolphin as they went. I work at a restaurant inside a casino, similar to Subway. Me: *puts lettuce and mayo* “No meat on it?” Very few old men are vegetarian and some get very pissy when you suggest anything of it, so it helps to ask. I spent a summer working as a server at a dock bar in a major east coast city. This story occurred the first or second weekend after being hired—and hired with reserve as a favor to a buddy of mine who was a manager there (part of the appeal of the bar was that all of its service staff—except me—were girls in their early 20’s wearing tight clothing). On Saturdays during the spring this particular bar is unbelievably busy; as you might imagine, after a cold winter, people love drinking outside. This particular Saturday was an unseasonably hot day and we were packed. We were very lax about the way people sat (or stood) in the dining areas. That shift I had 16 chairs in my section initially, but between extra chairs being pulled up and people standing, I was probably serving 30-35 people. Obviously, this creates difficulty in mobility and makes it very difficult to get from table to table. I had some very narrow spaces where I was having a very difficult time squeezing between tables. Please keep in mind that when I was a child, my parents would bribe me with money to NOT talk, so I am not usually at a loss for words. Never in my life have I felt been as speechless as I was at that moment. I turned around without saying a word. There were three managers on duty (including the GM and my buddy) and I was mortified to have to tell them what just happened. They were all just as speechless as I was. The GM went over, though, and calmly explained to them that I was in not, in fact, rubbing my balls on his aunt’s neck, and the guy sat back down. The rest of the family, including said aunt, were mortified and apologized, but the guy sat and gave me the death stare the entire rest of the time he was there. I refused to serve him any more alcohol. - Requested fries be unsalted every time and continually complained they were tasteless, so he requested a side of seasoning salt. If he was brought the salt on the side before asking for it, he berated me for bringing him salt with his unsalted fries. - Ordered the turkey sandwich to try to be healthy, but wanted the bun extra buttered when toasted and about a cup of extra honey mustard (fyi, the honey mustard is basically mayo flavored with honey and mustard). - Routinely ordered the catfish, then would argue to heaven and hell that he wanted cod, even when clarifying the order multiple times before putting it in. Since cod is more expensive, he argued he should get his meal for free or have the catfish price. 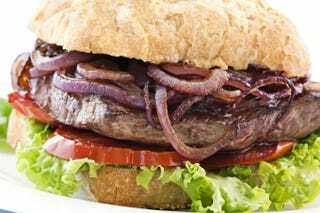 - Our burgers were cooked medium well unless specified, and he sent back a cheeseburger once and requested a new one cooked well done because his doctor told him he was not to have red meat. Note: I do not want poop/vomit stories. Please stop sending me poop/vomit stories.